It's no secret that we LOVE elopements, and this wedding was one of our sweet, intimate, crazy romantic fall elopements. This couple chose a simple, elegant fall theme and the prettiest details. Thanks to Mariann J. Photography for these beautiful photos! For more info on our super popular elopement collection, click here. 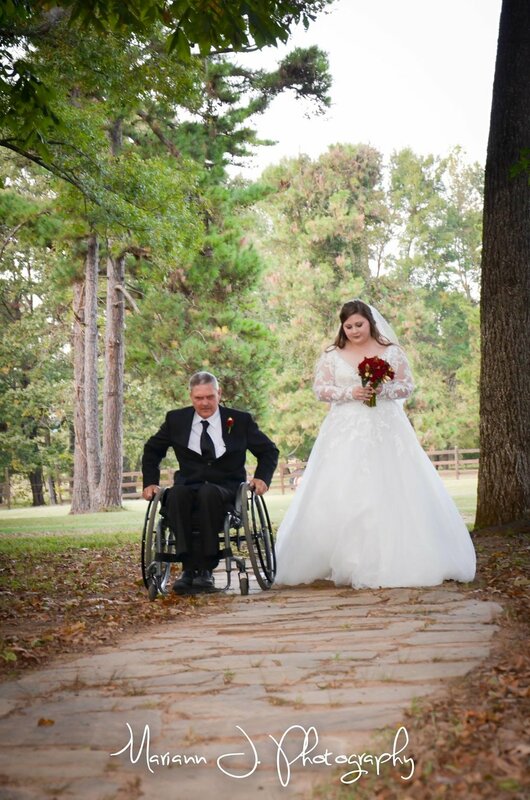 Destiny and Dalton were married at The Barn at Twin Oaks Ranch on October 19, 2017. Their colors were burgundy and gold. "I wanted a fall theme so the colors seemed perfect for the time of year!" Destiny said. 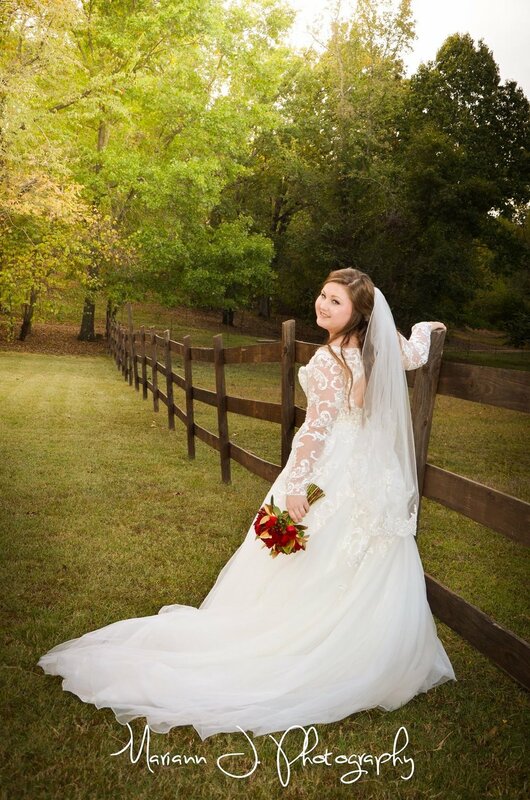 Destiny's bridal gown, from Always & Forever, was absolutely gorgeous. We always LOVE dresses with sleeves, and this one was beyond dreamy. We're dying over the lace detailing on those sleeves! Dalton looked handsome in a classic black tux with a burgundy vest and bow tie. What a beautiful couple! Some of Destiny's favorite details of the day were her bouquet and other florals. "I just gave a very vague idea of what I wanted and Lesleigh and Kori did amazing!" she said. 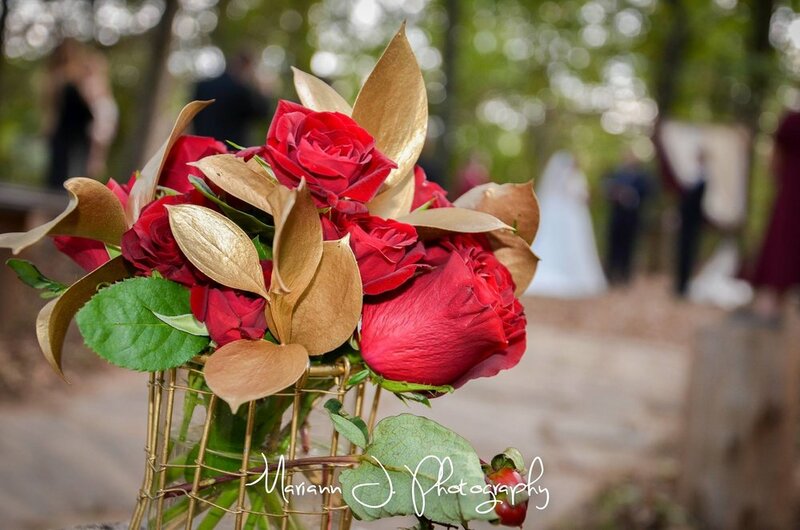 She chose a unique combination of red roses, red berries, gold leaves and a little bit of greenery - the perfect simple bouquet for fall and winter weddings! Elopement ceremonies are very romantic and intimate. Destiny and Dalton had a few of their closest friends and family present as they said their I do's. My favorite detail from their wedding was the altar! The one-sided burgundy and ivory drape was stunning and unique. The rest of their ceremony details were very simple and minimal, with small floral arrangements down the aisle. Destiny said one of her favorite details was the chandelier over the dance floor inside The Barn. "It is absolutely beautiful and made for some amazing pictures during our first dance!" she said. Destiny and Dalton's cake was simple and sweet. As much as I love a super detailed cake, I think simple white ones are my fave! The red flowers and gold backdrop were the perfect touches. One thing Destiny will always remember about her wedding: "Shoving cake in Dalton’s face at the reception!" Destiny and Dalton headed to New Orleans to celebrate the beginning of their marriage. "We spent a couple days in New Orleans exploring and then went on a cruise to Cozumel," Destiny said. "It was amazing and I can’t wait to go back!"